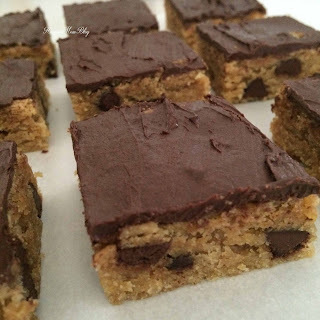 Very Best Baking's Chocolate Peanut Buddy Bars recipe is one that I've been making for years and years. It's so easy, and the end result is a peanut-buttery, chocolatey delight! I added a little more chocolate chips than the original recipe required - because you can never have too many! And I love that this is a one-bowl recipe! Combine peanut butter and butter in a large bowl until smooth. Beat in sugar, eggs and vanilla extract. Spread batter into parchment-lined 9x13 inch baking pan. Sprinkle top with remaining chocolate chips and let stand for 5 minutes. Chocolate chips will be slightly melted. Spread evenly.